Continued access to traditional foods plays a vital role in maintaining cultural traditions and insuring the stability of family units among immigrant women. Kitchen Incubators like La Cocina in San Francisco’s Mission District offer the means to create new food businesses that strengthen these communities. 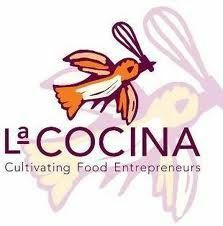 LA COCINA (“THE KITCHEN” IN SPANISH) PROVIDES AFFORDABLE COMMERCIAL KITCHEN SPACE AND TECHNICAL ASSISTANCE TO LOW-INCOME AND IMMIGRANT WOMEN ENTREPRENEURS GROWING THEIR OWN FOOD BUSINESSES. Not only do they supply space from which to launch that dream but also support a vibrant community of fellow entrepreneurs. They believe everyone has the talent and capacity to build a successful food business. La Cocina is located in SF’s Mission District, an ethnically diverse and economically vulnerable neighborhood. Food lies at the heart of this community, and you don’t have to look far to find hidden entrepreneurs in the kitchens of many homes. Executive Director (and chief Dishwasher) Caleb Zigas believes every cook should have the chance to earn a living doing what they love, even if it’s in a highly regulated and competitive industry.